We, Nicky and Paul Roper, the owners of Sunnyside Guest House welcome you to the Lake District, which is undoubtedly one of the most beautiful places in the World. We aim to take responsibility for our impact on the environment and wish to do everything we can to help protect this precious landscape together with the fauna and flora that live in it. We want you to have a wonderful time whilst here and we do not want to compromise your visitor experience as a result of the way in which we run our guest house. With nearly 16 million visitors to the Lake District each year we ask you to consider making some environmentally friendly choices to help reduce the impact on this UNESCO World Heritage site, contained in this policy are the actions we take and some ideas for you to use here and at home. A symbol of this commitment is our membership of Green Tourism. 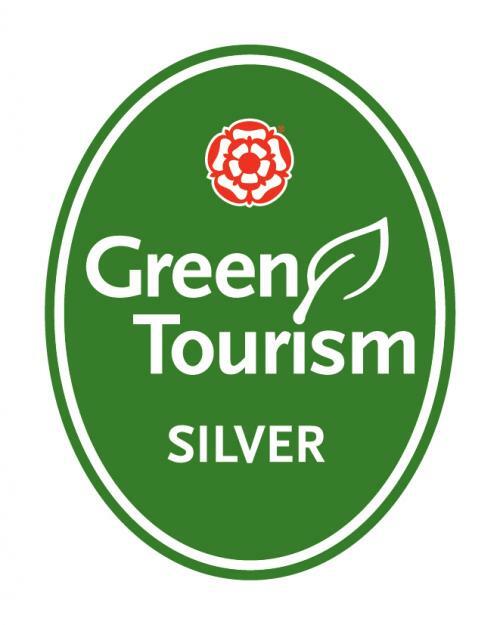 This scheme provides accreditation and encouragement for tourism businesses to reduce the environmental impact of their activities. By encouraging sustainable practices the scheme ensures the continued enjoyment of the environment around us for future generations. Sunnyside Guest House complies with all legislation and regulatory obligations required. Copies of Gas Certification, Fire Risk Assessments, Food Hygiene, Insurance, Accessibility Statement etc. can be provided upon request. Sunnyside Guest House is a three-story semi-detached property originally built in 1866, over time many changes have taken place to make it what it is today;a well-cared for, well maintained seven bedroom, all en-suite guest house, these are the additional actions that have been or are currently being undertaken. The building has had improved insulation in the loft spaces. Most windows have been replaced but we are currently replacing all old windows with energy efficient glass (to be completed by end of 2019). Where possible doors and windows are fitted with draft excluding seals. Local companies are used for all building maintenance work. We are a member of Keswick Fairtrade and use Fairtrade products wherever possible. The above suppliers deliver to us together with other local business therefore reducing our transport usage. We have the benefit of our own private car park, which helps reduce the pressure on the already overcrowded streets of Keswick. We actively encourage our guests to leave their car in a safe and secure place and use the excellent local transport network to get around the area, this is not only environmentally beneficial but very sensible as there is limited parking throughout the national park. We are well known for helping guests with advice on suitable walking and cycling routes from the guest house and can provide maps, local interest books, bird and animal identification books etc. We encourage cycling and have a secure cycling storage area for guest use. We are able to dry guests waterproof clothing and boots in a separate area away from their rooms. We sell tickets for the boats on several local lakes, which are a great way of getting around the area. For those that want to go further afield but do not wish to use public transport we can arrange high quality small group tours and even private tours. We use environmentally friendly Ecover cleaning products together with E-Cloths for all our household and bathroom cleaning. We use steam cleaning for sanitising surfaces. We encourage our guests to reuse their bathroom towels for at least three days, if however, they are staying for a week or more they will be changed on their fourth day. Our linen and bathroom materials are fully laundered on-site using eco-products, air drying as much as possible. All new appliances when purchased are low energy A or A+ rated. Where possible we have converted all our lighting to low energy bulbs. We use electric showers, which only heat the water that is required. For health and safety some lighting is required throughout the public areas, but this is kept to a minimum through the use of timers and motion detectors. Guests are encouraged to turn off lights that are not in use or required. Televisions are switched off at the wall and are not left on standby. We do not have televisions in public areas such as the guest lounge. We operate two Worcester Greenstar "A rated" boilers for heating and hot water. The guest house heating is separate to the owners living accommodation so that the temperature can be controlled independently and on different timers. We use radiator thermostats in all rooms, and these are checked and adjusted daily. We do all our own laundry on-site, which is air dried when possible but when it is not, we use a gas-powered dryer. We use dual flush systems in the majority of our toilets to minimise waste water, the remainder will be changed during 2019. We use electric showers which run at mains pressure, half of the water volume that most pressure fed systems use. Our outside plants are watered using collected rainwater. Food waste is kept to a minimum as we cook fresh to order each morning. All raw food waste is composted. All forms of glass, plastic, paper and cardboard are recycled through council collection services and we use drop-off points for non-regular materials such as plastic magazine wraps, bread wrapping etc. At this moment guest waste is done by hand but we aim to place separate bins in each room shortly. We utilise non-confidential scrap paper within our office for breakfast order pads, notes etc. All furnishings, furniture etc. that are no longer required are either donated to local charities or sold via local sites. We also fundraise for other worthy groups including Keswick Mountain Rescue and Hospice at Home. For the benefit of our guests and the local community we are also an Ambassador of the famous ?Theatre by the Lake?. Sunnyside Guest House is committed to becoming more environmentally friendly and reducing further the impact on the environment. As technology develops to use less power, monitor usage and supply power greener we will review and adopt those as part of our policy. 1) Conserve Energy - Switch off lights and close windows if the heating is on. 2) Give the Car a Rest - Try and use public transport whenever possible. 3) Shop Local - Help support the local community by shopping in Keswick. 4) Reduce, Reuse, Recycle - Try to purchase goods with no or little packaging, ask us if you wish to borrow a carrier bag. 5) Be Water Wise - Please don't leave the taps running unnecessarily.